Kids are back to school in Philadelphia and it’s causing quite a buzz! 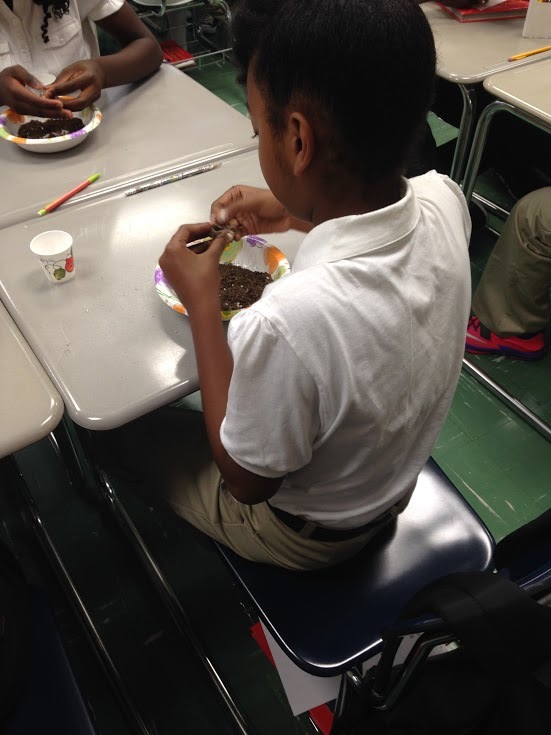 As Mayor Nutter visited classrooms throughout the school district of Philadelphia, Ms. Corbin’s lucky sixth grade class at Tilden Middle School kick-started their year with an environmental education lesson with the help of staff from John Heinz National Wildlife Refuge. 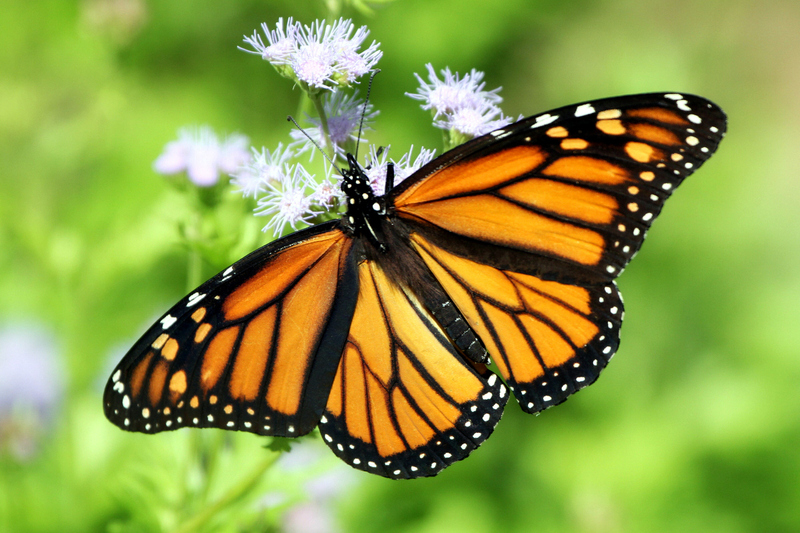 Students began the year utilizing observational skills and learning about nature through the beautiful and iconic species, the monarch butterfly. Tilden students examine a caterpillar and butterfly with magnifying glasses. We set up several hands-on stations throughout the classroom, and the students had the opportunity to explore and learn about the importance of monarchs and other pollinators. They used field guides to identify different species of butterflies and moths that aid in pollination. They also learned the insect anatomy that allows pollinators to actually pollinate plants and successfully grow. At another station, we taught them about the life cycle and migration pattern of the monarch butterfly with live examples of the drastic stages of metamorphosis. As you see in the picture above, with magnifying glasses, students examined live caterpillars, chrysalises, butterflies, and even helped name the critters that will be tagged and released! In another display, we demonstrated how humans rely on the work of pollinators for everyday items and food. Students got to make and sample chapstick with naturally pollinated materials like coconut oil, olive oil, and honey. They were also surprised to learn that cotton, peas, apples, chocolate, coffee and tea all need the support from pollinating insects to exist. Imagine living without coffee! Kelly teaching the students about foods that we rely on pollinators to produce. In addition to food, students learned that we can thank pollinators for other things. Students used coconut oil, olive oil and honey to make chapstick. After learning that our monarchs and pollinating species are on the decline, we also helped students make pollinator habitat in their communities with the use of “seed balls.” These bundles of clay, dirt, and seeds are kneaded together and thrown in a sunny area. It is a fun way to sprout a fresh and new habitat for our pollinator friends. Seed balls are easy to make and fun to throw! Did you grow monarchs this fall or are you doing anything to help this special butterfly, like planting milkweed or making seed balls? Let me know in the comments! 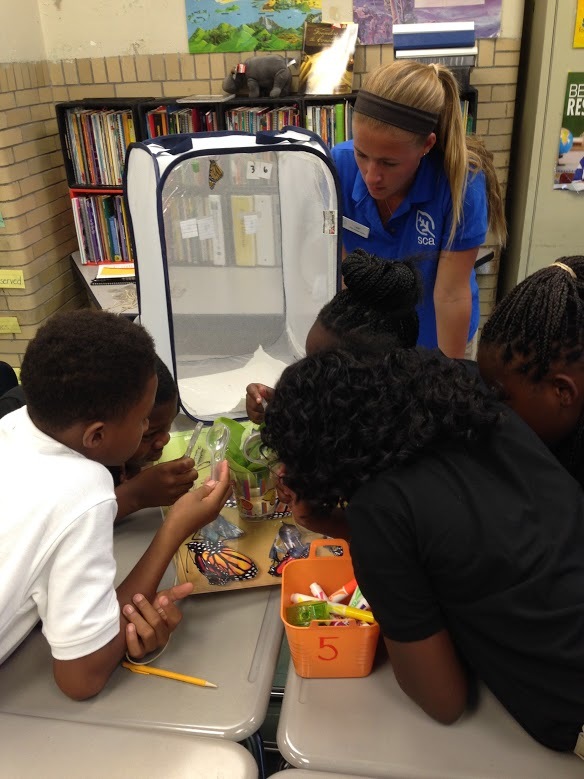 This entry was posted in Blog entries, Habitat restoration, National wildlife refuges, Youth and tagged #savethemonarch, chrysalis, environmental education, Leah Hawthorn, monarch butterfly, Philadelpia, Tilden Middle School on September 10, 2015 by leahahawthorn.